Mr. Lyons is the newest addition to the F10 family, opened in 2015 as a reimagining of Lyons English Grille. We’ve taken steak and created a “New Classic” giving it a conscientious modern update, with a menu that puts local small farms first. Our grand dining room is pure old Hollywood glamour with a steak-centered menu boasting infinite sides and the kind of table side service that instantly transports you to a by gone era. Our lounge offers something a little more relaxed, where you can savor a true classic cocktail or something seasonal and new. Mr. Lyons is steak done right! Whether celebrating a special occasion with family and friends or hosting a corporate event, Mr. Lyons Steakhouse can accommodate all of your special event needs. Foundation 10 is a collection of great food and great people in Palm Springs, California. We’re three restaurants and a hotel. Ample open air parking as well as accessible locations.On street parking is also available. The parking lot can also accommodate buses for large private groups. Winemaker's dinner with Chris Howell of Cain Winery on Tuesday, April 17th. Four courses with wine pairings for $110 per person. Outstanding food and service, but be sure to bring a jacket -- they keep it as cold as a meat locker in there! Loved the wait staff. Very friendly and knowledgeable! Food was amazing. Drinks were weak so we stuck with one for the night. I had always wondered about this restaurant . It's a gem and a great throwback to steakhouses of yesteryear. The ambience is wonderful and the service was attentive and professionalism. The food was good, but not outstanding. I would give it a 2nd chance still. We LOVE the creative & delicious food creations here! You know you are in the capable hands of a very talented chef & staff. Great choices! The best Washington state and Oregon oysters ever! Lobster was delectable as was the prime rib. Sides are magic here! The Crispy Brussel sprouts are outrageous! Definitely my favorite early dinner restaurant in Palm Springs! The menu is online and the choices are amazing. And the banquettes are comfy & private. Bet you can’t make up your mind on even the third read! The evening and food was awesome as was the service from Andrea B. She was spot on in recommending a wine to compliment our meal. She was fun and very genuine. They anticipated our every need and were on it before we asked. Would highly recommend and will definitly go back. Sunday Prime Rib Special is always the draw for us! Old school steakhouse feel with new school food! Delicious food and great service! Great steak. I was a little surprised they only had grilled Brussel sprouts as a side vegetable (other than baked potatoes). No green beans, carrots or asparagus. Our experience was top-notch from beginning to end. This was our first time at Mr. Lyons. We are residents of Palm Springs, and this was a special occasion for a friend's birthday. For the most part we were disappointed with the meal. 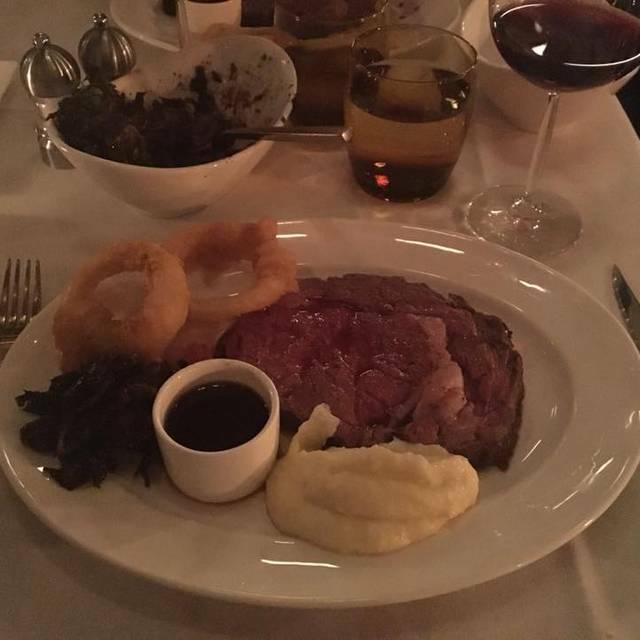 Two of us had the Onion Soup and the Prime Rib (medium rare). We truly love onion soup, but this fell flat. The cheese was excellent, however there was nothing special about the body of the soup. It was just bland. We requested that the Prime Rib be Medium Rare. Both came out more Rare than Medium Rare. Our feeling is that if you bill yourself as a Steakhouse, you should know the difference between Rare, Medium Rare, Medium, Medium Well and Well Done - and no mistakes should be made with that. Had it just been the two of us, we probably would've sent them back, however with a 3rd dining with us it would have changed the dynamic of eating together. The 3rd person in our group appeared to be happy with his meal, Oyster appetizer and the Scallops for dinner. The Onion Rings side we ordered were especially good. Not greasy at all. Dry and very tasty. Our server was wonderful. He took his time with us throughout our meal and it was a pleasure to waited on by him. We thank the restaurant for the complimentary Baked Alaska for dessert for my friend's Birthday. With drinks the bill was @ $315 - pretty pricey for what we considered to be only standard fare. It was nothing special. Sadly we left disappointed and doubted that we would return. Fantastic evening. Food, service and environment were all top notch. Amazing. The food was fantastic and the service was impeccable - what you would expect in years gone by. Had a great date night here and would go back in a heartbeat. It's truly a gem - especially the back bar. Cozy, nostalgic, and fun. 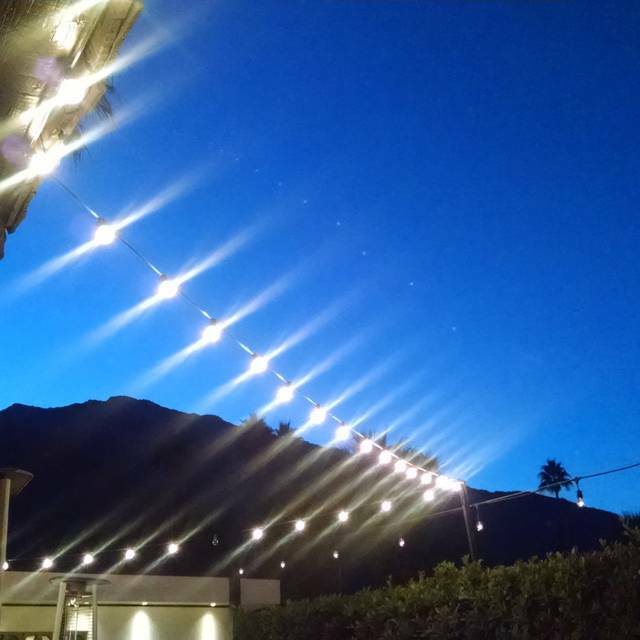 One of our favorite spots in Palm Springs, whether you are just having cocktails and appetizers in the bar or going for full dinner, always a great experience. Food and service are excellent! Just celebrated our 10 year anniversary and a birthday and were given the royal treatment. Thanks to the Mr. Lyons staff for taking great care of our group. Very swank restaurant, great food, wonderful staff. This was my second visit, and after having such an amazing experience the first time around, I was disappointed the second time around. We were there on a Friday night with family and friends and even though we had fun the food, server and wine selection was lackluster! I was surprised that the waitress didn't even have any dinner specials to offer. At the end of the night, I don't feel the expense was worth it. The bar, and bartender were great and we'll definitely return to the bar again! Very enjoyable, good food, we could actually hear each other! Will go again! We went to celebrate my birthday. The place is lovely. The service excellent. With steaks and prime rib all sides are alacart. I picked a baked potato. It was cold and hard to even cut. The butter wouldn’t even melt. It was so undercooked it was barely edible. Then it cost $9. For one badly prepared small side. It was disappointing to say the least. Didn’t ruin the evening but was very unhappy with it. Unremarkable, expensive and boring. I was disappointed. We went to Mr. Lyons to celebrate a family birthday. Great food, great service. We will go back. On the plus side, the service at Mr. Lyon’s was excellent. Our waitress was very friendly and attentive and remembered our special requests. The decor is beautiful with a mirrored ceiling fixture that reflects the patterns on the floor. On the minus side, the NY steak was a bit underdone and lacked flavor. The ceaser salad dressing was just OK. The wine list was not extensive and the prices were very high. Finally, we always order after dinner coffees and they had none available the night we were there. Steaks were prepared beautifully and the sides were very tasty. Great space for dining. It arrived under and hard and we told the waiter he shrugged and said this is not the first time someone has said this and that the chef prefers under potatoes. The chef is wrong . Management needs to change this ASAP ! The restaurant was closed, despite making reservations far in advance and receiving a confirmation email the day prior to our reservation. Great food. Attentive service. Just moved to the neighborhood. I’ll definitely be dining there frequently. Food was good, although not executed to the level expected. Mr. Lyons is now part of a restaurant “group,” but is pretty good, anyway. The decor is casual elegance, and the service is attentive. The food is “good,” which is standard in the area (hospitality is quite competitive in Palm Springs, and there are hundreds of great places to dine. We enjoyed it, and we look forward to our return to Mr. Lyons. We had such a great time! Make sure to show up early to grab a drink at Seymour's the attached speak easy! Waitor was excellent. Food was not as good as we hoped. My chicken was dry and my husband ordered the Wagu steak and we questioned what kind of meat it was. Definitely have had better. Drinks were really good though. Probably won’t come back here again next time we are in Palm Springs. Service and food were excellent! We’ll be back next time we are in town! We initially were displeased with having been seated in the garden room, however, it eventually was the livelier of the two rooms so we were glad we ended up there. The chairs in the garden room are aesthetically pleasing, but not very comfortable. But, the decor is nice, though not as elegant as the main room. The grass fed fillet mignon was excellent, but my New York steak, though I asked for medium rare, was closer to medium well, so it lost some points. 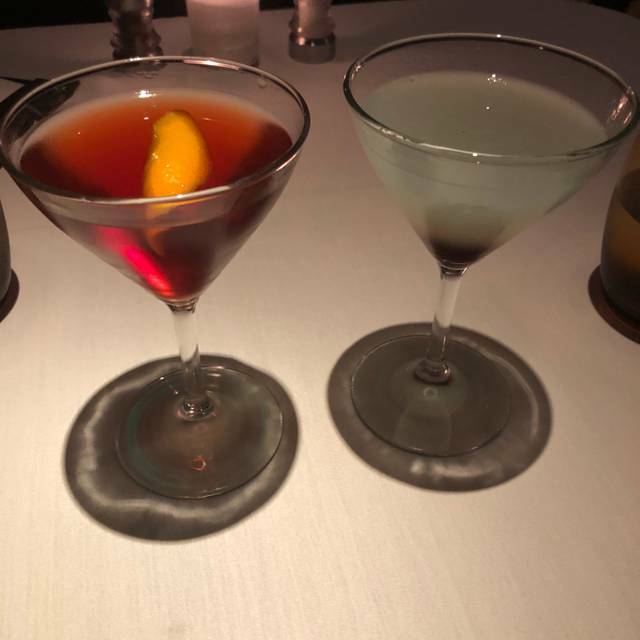 For drinks I would recommend the whiskey sour and the French 75, but if you don’t like the smokiness of scotch stay away from the penicillin. Mac & cheese and brussels sprouts were quite good as sides, and they know how to make a nice, dry cappuccino to finish of the meal. Here is a good tip: there is no corkage fee, so you may bring your own selection of wine. 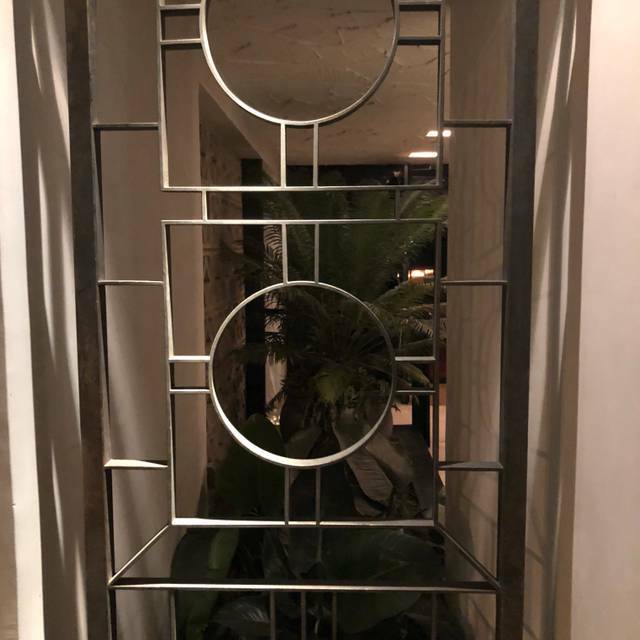 Overall, though it has a decent ambience and is a generally enjoyable experience, there are other fine restaurants in Palm Springs that offer a better environment, better service, and better food for the price. Food was excellent, but service was poor. The Brussel Sprouts and shrimp cocktail were both amazing!